Document Size: Min: 5 1/2" x 8 1/2"; Max: 14 7/8" x 11"
Document Spine Width: 1/16" up to 2"
System Capacity: From 1 to 150 sheets of 20 lb. paper. Processing Speed: Load up to 4 documents at one time. Bind one document every second. Document Spine Widths: 1/16" to 5/8"
Processing Speed: Batch-load up to 50 documents at one time. Bind one document every second. Performance is subject to user environment. Document Spine Widths: 1/16", 1/8", 1/4", 3/8", 1/2", 5/8"
System Capacity: Up to 720 printed pages on 20 lb. paper. 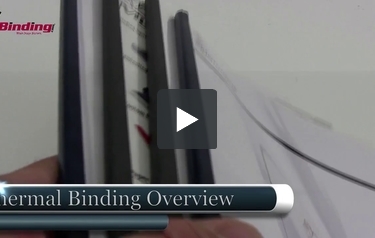 Document Spine Widths: 3/4", 1", 1-1/4", 1-1/2"
Welcome to MyBinding video. This video is designed to give you an overview of thermal binding, both the supplies and the equipment. Many thermal binding companies provide thermal binding covers. These can be soft-bound, hard-bound or have a steel spine. Some companies use adhesive tape in their thermal binding process. No matter how you do it, thermal binding is quick, it's very easy, impressive, allows you to open your book flat and, most of all, there are no holes punched and the bind itself is surprisingly strong. Now, let's have a look at some systems and machines. Some of them are very simple. Some are like a toaster with one little button. You simply take the insides of your book, put them into the thermal cover, jog everything into place and drop it like a piece of bread down into the slot. When the binding cycle is over, the glue has been warmed, you set it to the side to cool and it's all done. This is essentially the basis of all thermal binding. Other machines are a little bit more complex or stylish. Lifting up, stowing away and allow you, after you put your book into the slot, to choose a binding cycle that's best for your book. Some systems require that you use their binding covers and others allow you to use any cover that you can create on your own. More heavy-duty models, such as this ProBind 2000, can do both soft and hard cover and are great for book restoration. UniBind uses a system of magnets to heat instantly their metallic spine, and some systems allow you to process more than one book at a time. Powis Parker makes a fast back line of thermal tape binding. You simply place the tape into the trough the insides onto that tape, push the button and you're all set. This allows you the control to design any kind of cover you want and bind it together and can be used with hard backs as well. So whatever it is that you need, know that thermal binding is easy to do, very customizable and a great way to go. So click or call us and we'll help you find the right system for you. For more demos, reviews and how-tos, check out MyBinding.com.